All over the United States, American Indian communities are working to promote and improve educational opportunities. 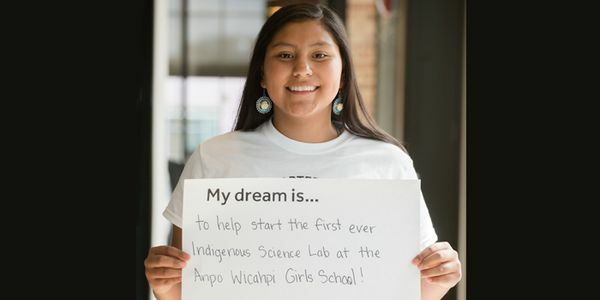 Tara (Ogala Lakota), a 14-year-old from the Pine Ridge Reservation in South Dakota , dreams of helping develop the first ever Indigenous Science Lab at the Anpo Wicahpi Pine Ridge Girls School. Tara's science lab will supplement the school's science curriculum, which is rooted in Lakota culture and beliefs, and offer an opportunity for hands-on application. This project will create a space for scientific exploration and spark interest in students to pursue fields of science, technology, engineering, and mathematics. It will also improve the presence of Native Americans and women in the field of science. "It is very hard to get students motivated in science when your school does not have a lab, lab equipment, or an interest from outside labs to help students conduct these types of experiments or projects. Our school is new, only in our second year and our resources are very limited but our craving for scientific knowledge is not." As one of Running Strong's "Dreamstarters" – Tara is in a group of ten remarkable young people with dreams of promoting education in their communities. Together, by supporting Tara we can help make sure her dreams come true. Sign the pledge and support Tara's dream of starting a science lab at the Anpo Wicahpi Pine Ridge Girls School.